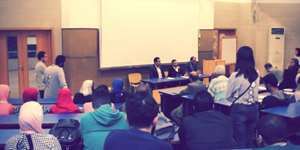 The Petrochemical Engineering Department held an open meeting between a number of leading petrochemical experts and the parents of the petrochemical first year students to discuss the prospects of the petrochemical industry in Egypt. This was held on Thursday 10/4/2018 at 10.30 p.m. The meeting was opened by the words of Prof. Mohamed Gaber Abou Ali, the Dean of the faculty of Engineering and Prof. Mohamed Fahim, the Head of the Petrochemical Engineering Department. This was followed by three statements; the first was for Eng. Ahmed Ismail, the Director of the Alex Fert Ammonia Factory, the second given by Eng. Ahmed Abdel Fattah Mekky, the Deputy Director of the Oil Extraction Unit at Alexandria Petroleum Company and the third was for Eng. Mohamed Ibrahim Ramadan, the Director of the Performance Evaluation and Production Planning Department at SIDPEC. During the meeting, the petrochemical experts explained the considerable significance of the petrochemical industries in Egypt and its promising future especially after discovering Zohr Gas Field which could contribute to the prosperity of the petrochemical industry in Egypt as well as increasing job opportunities. The parents’ enquiries were all answered during the meeting.